Venue will open at 2:00pm each day. Wristband activation will be required for entrance into the venue. If you purchase a 3-day pass, you will be issued a single wristband that is valid for all show days. Venue ins and outs will be allowed. Space is first come, first seated. You cannot "claim" a spot then leave it unattended. Low back chairs and blankets are allowed in designated GA sections. Please obey posted signs. No chairs or blankets may be left overnight. GA attendees are not allowed in the Reserved Seating or Grandstand areas. You must sit in your assigned seat. Personal items must be kept under your seat or on your lap. 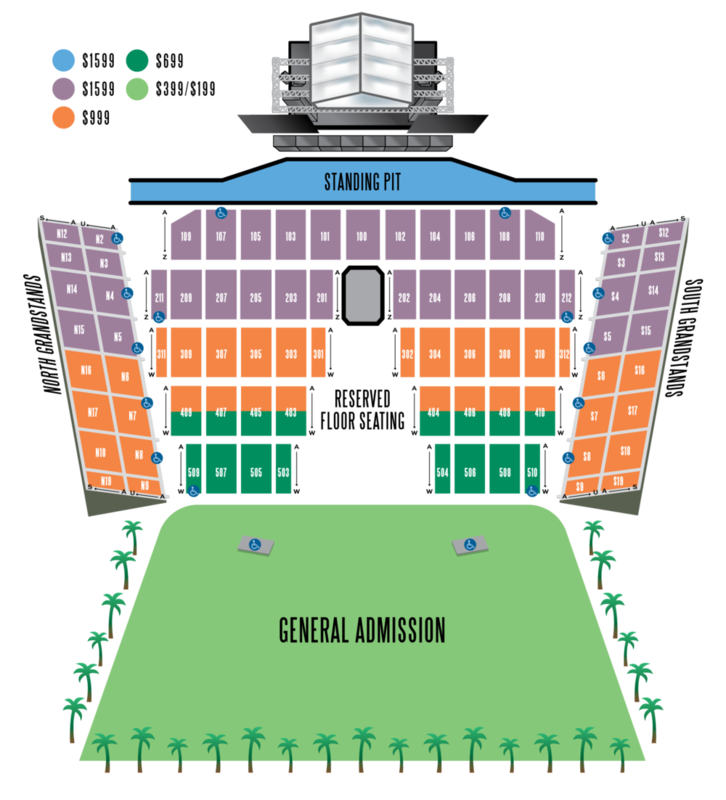 Reserved and Grandstand ticket holders can visit the GA section. More room to dance! Standing/dancing is only allowed at your seat. You may not stand in or block the aisles. All Reserve and Grandstand seats have backs. Shipping for both weekends began in early September. Please note that shipping will be ongoing and continue until at least ten days prior to the festival. A tracking code will be generated and emailed to you when your order is ready for shipment. ADA passes must be picked up at Will Call by the original purchaser. No alternate will-call pickups will be allowed. Signature required for seated orders (excluding PO boxes). Each order is shipped separately and will take several weeks to complete. The deadline to change your shipping address is August 15, 2016*. No exceptions. For help updating your shipping address, please review our Ordering FAQ. Orders after the deadline will be available at will call only. Orders will not be re-shipped or shipped twice under any circumstances. Orders unable to be delivered for any reason whatsoever (e.g. lost, stolen, wrong address, returned to sender) will be required to be picked up at Will Call by the original purchaser. Photo ID and credit card used for purchase are required for any Will Call pick up. International orders can be shipped for an additional $25 fee or held at Will Call. 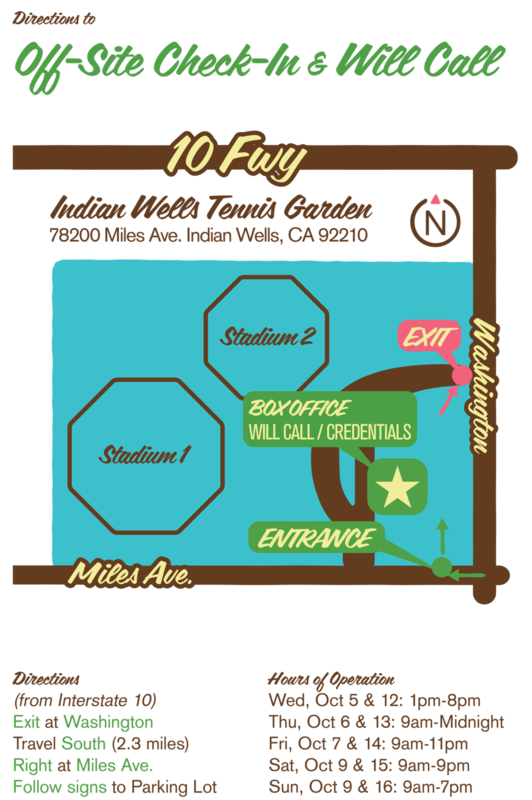 Box Office/Will Call for Desert Trip will be located at the Indian Wells Tennis Garden, which is about a 15 minute drive from the venue. * You WILL have to sign for this package. UPS will attempt to deliver 3 times before it is returned to the sender, after which it must be picked up at Will Call at the event. Prices do not include service fees. For a full list of service fees, please click here. There is an eight show pass (2 standing pit/6 of any other) limit per order, household and customer account. Children age two and under are free, but will not receive their own seat. No upgrades are available after ticket purchase. Purchase plans will not be available for this show. For ADA passes, please contact Ticket Support by phone at (855) 414-6340 on Monday, May 9 at 10:00am PDT. Ordering information will be posted prior to the on-sale date. If you order online, please make sure to request ADA tickets. On the form to request ADA tickets, there will be an option to request accessible seating, which will be available at all price levels. Each disabled guest can request companion tickets as well as accessible camping, RV spaces and/or shuttle passes. Frame your Desert Trip memories on your wall by purchasing a premium quality silk screened poster, delivered directly to your home. Posters are available in both 18"x24" and 27"x36" in white, black and wood frames.